What a great school year it has been for the students from Windham-Ashland-Jewett’s (WAJ) Science Club. For six sessions out of the year these students got the chance to explore the Forest Ecosystem at Cornell Cooperative Extension of Columbia and Greene Counties’ Siuslaw Model Forest. The club participants wrapped up another great year with two sessions in June covering stream ecology as well as freshwater fishing. 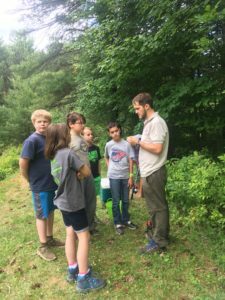 With the help of Fran Martino (River Haggie Outdoors) and Deb Valerio (WAJ Teacher), CCE Environmental Educator Andrew Randazzo taught the group about the importance of water conservation. The WAJ Science Club studied stream quality by assessing macroinvertebrates, studied water temperature and PH and got a chance to learn about fish identification. Not to mention, they got to spend an afternoon fishing! For some students it marked the first opportunity they have had to get out and fish, for others it was the first time they thought of fishing through the lens of conservation. While it may be sad the club is ending for the year, no one can say our year of learning wasn’t memorable! Cornell Cooperative Extension of Columbia and Greene Counties looks forward to continuing the club next year with programming on Citizen Science. Thank you Windham Foundation for funding an amazing year of learning. The WAJ Science Club would not be possible without the generous financial support of The Windham Foundation. Their support has enabled the science club to run for several years, offering young people an exciting chance to learn about the natural world.